This romance novel contains explicit sexual content and is appropriate for readers 18+ yrs. Approximately 390 pages, no cliffhanger, but an ongoing story with a sequel in the works. Introducing CEO Shane McIntyre, the newest hot book boyfriend on the scene. 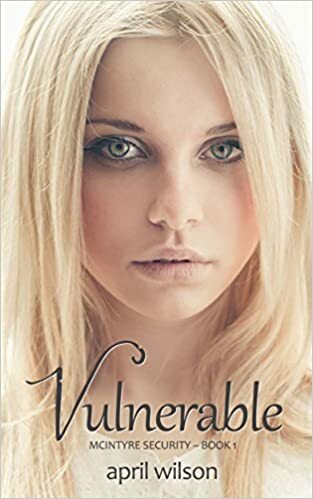 If you love alpha protectors and bodyguards, with a little suspense thrown in, you’ll love Vulnerable! Beth Jamison had a rough start in life. She survived a childhood abduction, but her traumatic past still haunts her, and she suffers from anxiety and issues with intimacy. Beth doesn’t know it, but the man who kidnapped her has just been released early from prison. When Beth’s brother hires McIntyre Security, Inc. to protect Beth and conduct surveillance on her kidnapper, Beth has no idea she has secret bodyguards keeping her safe 24/7. With his money and good looks, CEO Shane McIntyre has never been short on feminine company, and he’s developed a reputation as a “love ‘em and leave ‘em” kind of guy. But that changes when Shane meets Beth. Their mutual attraction is instant and intense, and Shane falls hard for Beth. Shane has his work cut out for him if he’s going to gain her trust and get past her fears. This alpha protector is determined to keep Beth safe, but he’s also determined to make her his.